I realised that I hardly ever write about what I do day to day. So today I thought I'd fill you in on some of the things I've been doing in the last few days. Halloween came and went, and on the day itself we had an afternoon birthday party for our niece whose birthday had been the previous day. The next day, we went to Hertfordshire for a day out on the bikes, starting along the canal from Rickmansworth. There's nothing sadder than an abandoned Halloween pumpkin, is there? Some of the boat people were scratching their heads about where the oil you can see on the water came from. 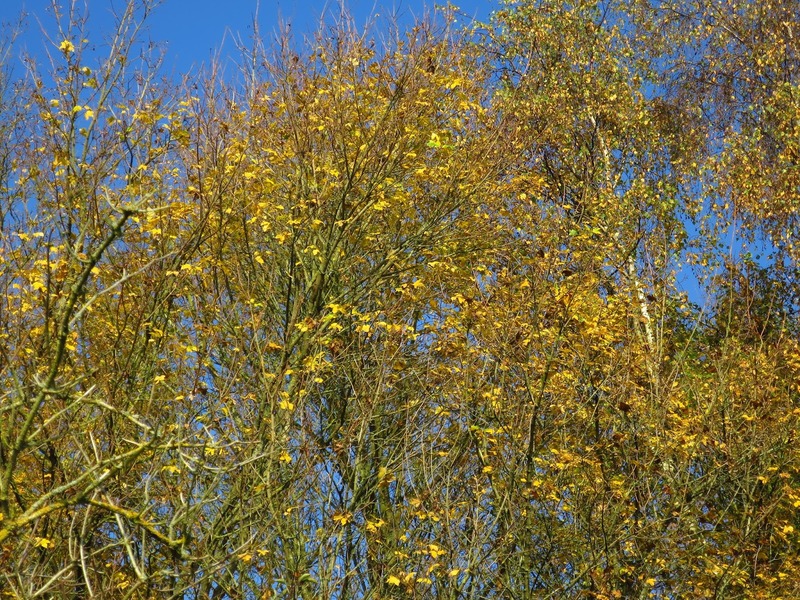 Our aim was to catch the last of the autumn colours. You get on the Grand Union Canal quite near the tube station, at Batchford Lock, where there's a Waterways Trust shop and info point, plus a nice outdoor cafe. We were aiming at the beautiful Whippendell Woods, towards Watford. It is not very far, but we took it slowly and wandered off the route a lot. When we began, it was quite misty. Everything was still and silent, and this rope figurehead looked a little chilly in the mist. But the weather soon brightened up. Soon the fog burned away and it turned into a really perfect Autumn day. Canals seem to attract residents who like to live life differently, and one day I plan a post all about the boats to be seen on an amble down the towpaths. But although many of the boats are highly original, I hadn't seen anything like this before. 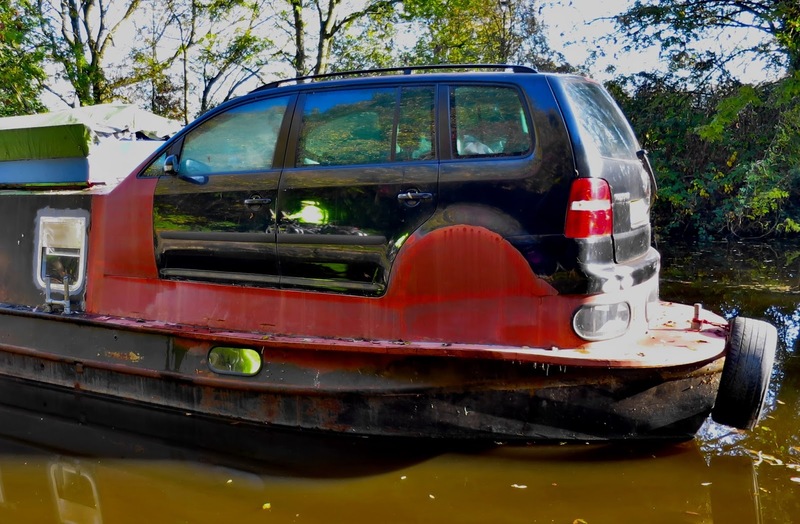 At first I thought the car was parked on the boat. We picked lots of very late blackberries, and what's more, they were tasty. Usually the saying is that the witch spits on blackberries picked after 1 October, but she hadn't managed to get to these ones. Perhaps she'd lost her broomstick over Halloween. I didn't want to break the web, which was covered in dewdrops from the mist. There's a nature reserve at Croxley common, with one of those bright, shallow rivers that you get in this part of the country. The common was dotted with all kinds of fungi hiding in the grass, some startlingly decorative in the sunshine. 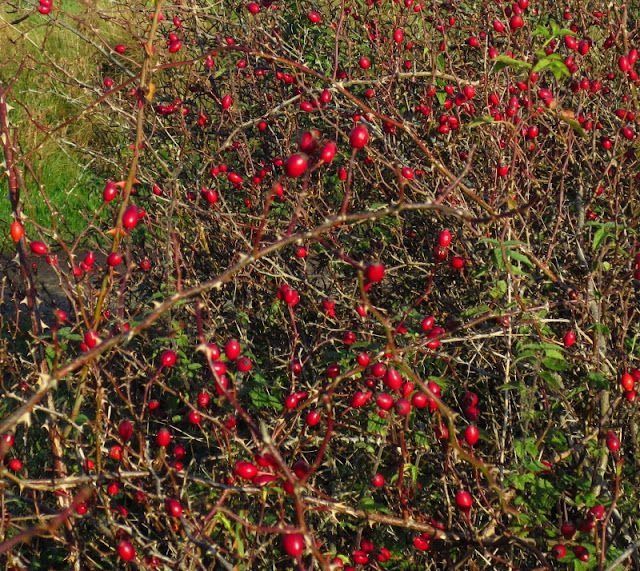 Judging from the number of rose hips, the area must be spectacular in June when the red, white and pink roses are out. We didn't reach the woods till the sun began to sink, around four pm. but we cycled across the hill on a carpet of fallen leaves and got back to the canal, and thence to the station, before it got completely dark. At some point, another niece invited us to her birthday party which was at Save the Date cafe in Hackney, created by Ruth (below) and her partner James. It's an unusual place, hand built with a storage-container kitchen. 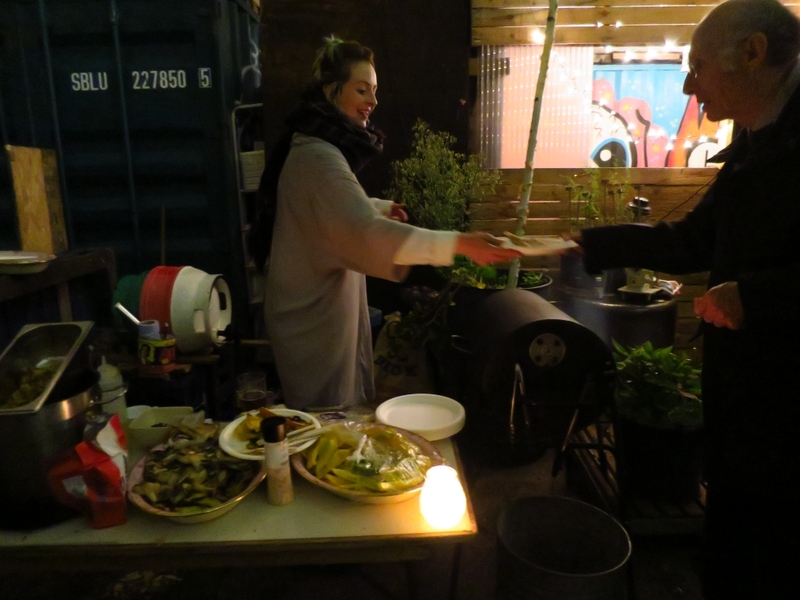 It is a cafe with a mission, and uses exclusively overstocked// surplus food donated by supermarkets and other organisations. Our meal was from the veggies that had formed part of the Royal Horticultural Society's autumn show. Really good! 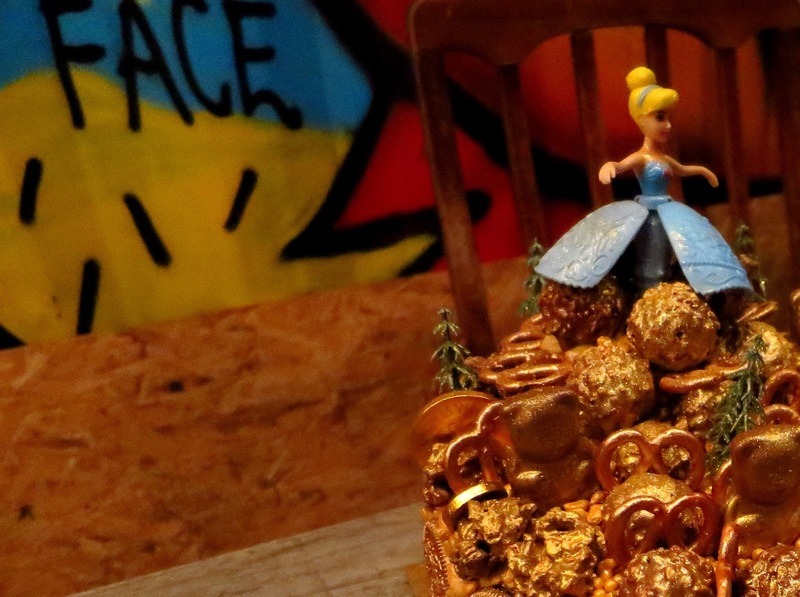 Our niece's buddy, who runs a company called Kookybakes, had spent hours doing her a golden birthday cake. I never even knew edible golden spray existed! Everyone loved this magical golden forest - can you see the bears and pinecones? 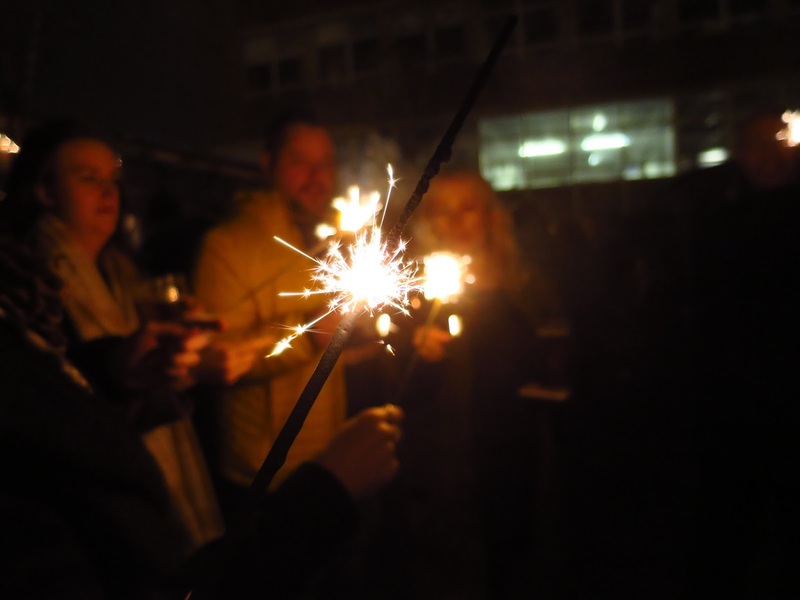 There were sparklers too, which are always fun. I think each window was meant to represent a different planet. I am not sure what this one was. 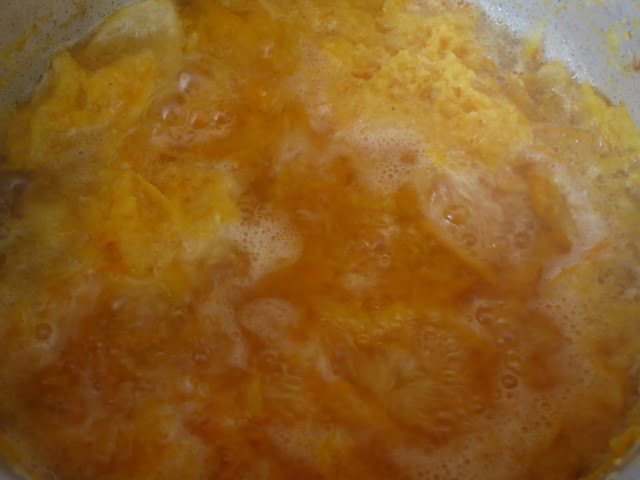 Today, among other things, I made some marmalade. 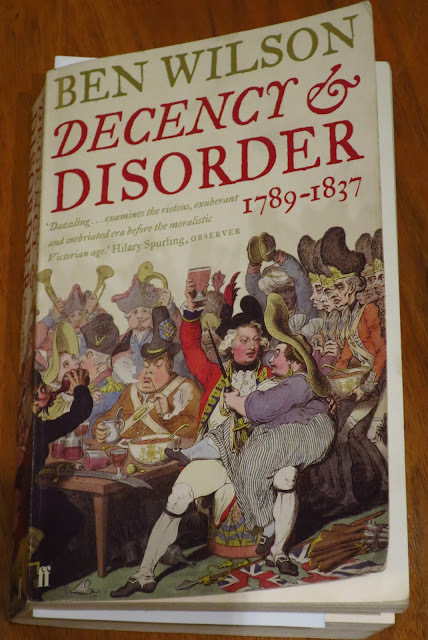 And I'm reading this book, which describes how the wild and licentious 18th century changed into the unutterably stuffy, priggish Victorian age. It's very well written and it's telling me some downright astonishing things I never knew before. So I can highly recommend it. Finally, I have named the Malaysian stuffed monkey "Durante"! And here is a photo from just outside World Travel Market on the day I got him. The fog was still there but the sun was breaking through. What a busy and photogenic life you lead! I have a theory about people who live by any sort of water- river, ocean, pond, lake. The water is a calmer, a soother, a bit of a natural tranquilizer so people who might subconsciously desire this sort of thing (or consciously!) are drawn to living by the water. And many people like this can be on the definite artistic side with less regard for the normal, the usual. That's what I think, at least. I think this is particularly so with canals, which don't have tides and are very placid and even. I always thoroughly enjoy hearing what you've been up to - especially since my life here in the mountain wilderness seems so dull in comparison. The end of autumn is a melancholic but beautiful time of year. I always have pumpkins for Halloween, but I seldom carve them because it seems like such a waste. The photo of the pumpkin in the canal is sad. 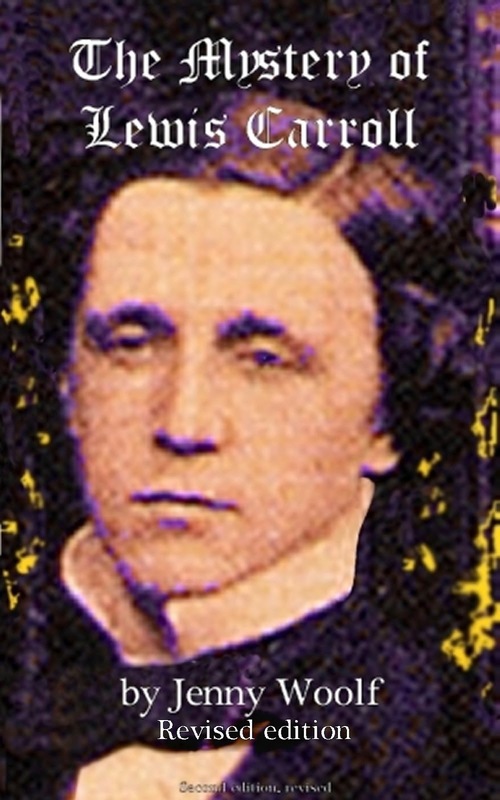 Durante is an appropriate name for the monkey. My favorite photo is that of the web over the blackberries - - and the brightly-colored fungi. That golden-sprayed cake looks wonderful - - but I would prefer your carrot, orange, and nut cake - - and the homemade marmalade! A few weeks ago my landlords returned from there bi-annual trip to the UK, and while over there this time visiting family, Denise (landlady) took off with friends to enjoy a trip on a long boat. She had a love time motoring along at a leisurely pace, apparently. These are the ones from Suffolk, right, Lee? I'm sure they had a great time in a narrow boat. What a wonderful ride, always enjoy going along canals. The book sounds interesting, will have to go looking for it. Lovely doings in your part of the world, it is nice to celebrate the birthdays of loved ones and your photos, as always, brought things to life...I've never had a blackberry from a bush, frozen only and I hear that they are not the same. Best to you. They definitely have a unique taste when picked fresh. The birthday cake you made looks absolutely delicious. 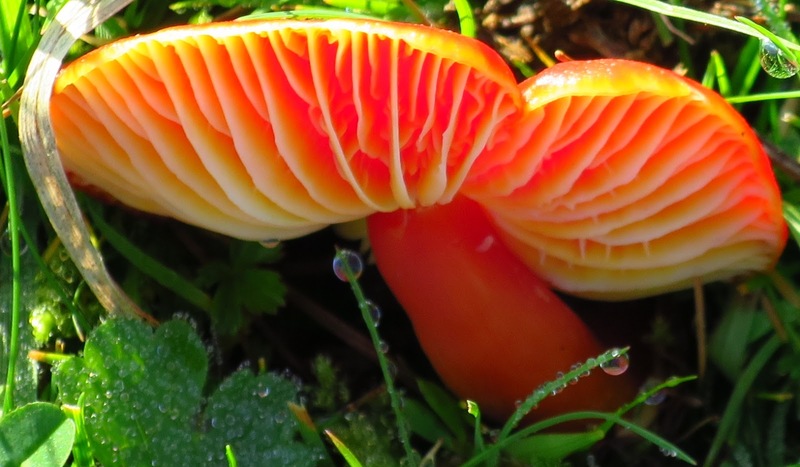 Your photos are all wonderful, but my favorite is the one of the colorful mushroom...look at all the tiny water droplets! Good things and sad things and happy things and regular, common, ordinary things all mixed up together in this crazy adventure we call life. Thank you for the lovely pictures, and please accept my condolences for the loss of your friend. Thank you, Jackie. She had a terrible 6 years, neighbours including myself were aghast at how she managed to continue to welcome guests, assert her personality and take an interest in visitors and the carers who had to look after her 24 hours a day at the end. She never complained to anyone, either. It was hard not to see her death as a welcome release because she suffered more than anyone should have to and eventually it was too much. A really perfect autumn day is one to be enjoyed and your beautiful pictures show that you did just that. Plus I adore Christmas windows. I can not wait to see more of your photos. I am so surprised and happy you named him Durante. As I wrote I remember watching his show with my Mum. Such nice memories. He always seemed such a cheerful man! This was a lovely post, Jenny! The autumn pictures are so beautiful, and I am glad you had such a perfect day after the fog burned away. The book sounds very interesting, and I like the concept of the café very much. It is similar to the charity shop my Dad works at, only that at the shop they don't make meals, they simply sell the surplus stuff given to them by supermarkets etc. Sorry to hear about your friend's death. Indeed, as you say, everyone has things happening in their lives which aren't great all the time. The charity shop your dad works at sounds like a good idea too. Here, a lot of people who run market stalls seem to get the surplus goods from factories etc. and sell them for cheap prices. It helps them make an honest living, and the stuff is rarely acutely perishable, like tea, coffee, biscuits, canned goods etc. and within sell by date. I'm away from home but as my hostess was having a lie in I have just caught up with this post and your previous one. As always they are an interesting and fascinating read with your immensely enjoyable photos. As for Durante I wonder how many people will make the connection these days but it's spot on of course. A really remarkable resemblance in fact! You lead an interesting life, home and away. Loved the pictures, especially the yellow fungi. Oh what I would give to live by the water. I wanna be there! That canal trip was great. 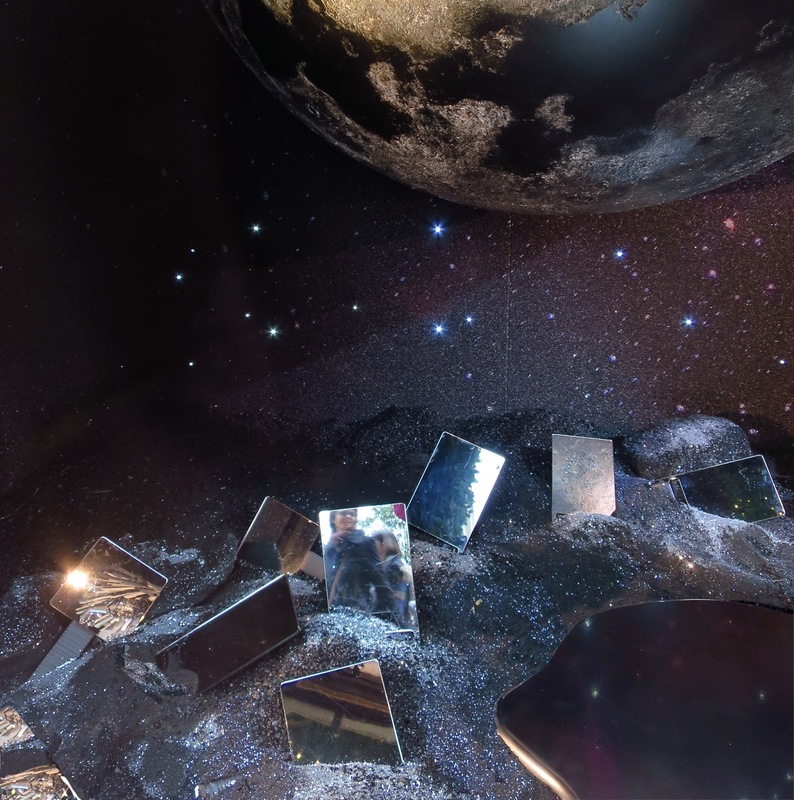 The photos are super and make me jealous! 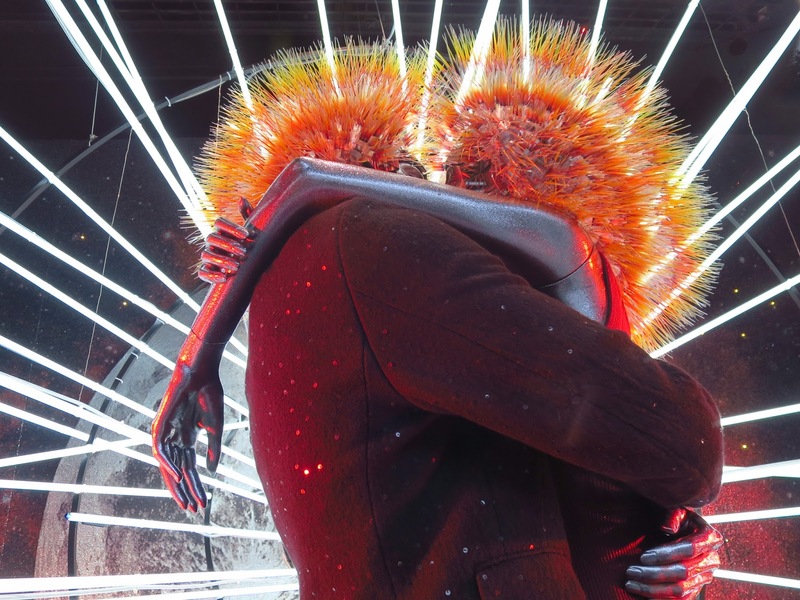 Not sure if I would wish to be in Oxford Street mind. Another great week for you and us! I like the bustle of Oxford St. in a way, although it's all a bit cheesy and commercial but you can get away into the surrounding small streets which have all kinds of interesting stuff. My favourite is always the Selfridges and Fortnums christmas windows. The idea of a golden cake really took my fancy. I can't find gold spray in our local supermarket and it probably comes from a specialist cake supply shop. Now THOSE are places I can't resist!! You've been having quite a life -- happy and sad. I'm so sorry about your friend. It seems like it happens more and more with every year. But you have made some great smiles in the past days, too and have some stunning photography to show for it. I gasped when I saw the weeping willow on the water and then the fungi! Oh, my! And your parties sound delightful and filled with joy. 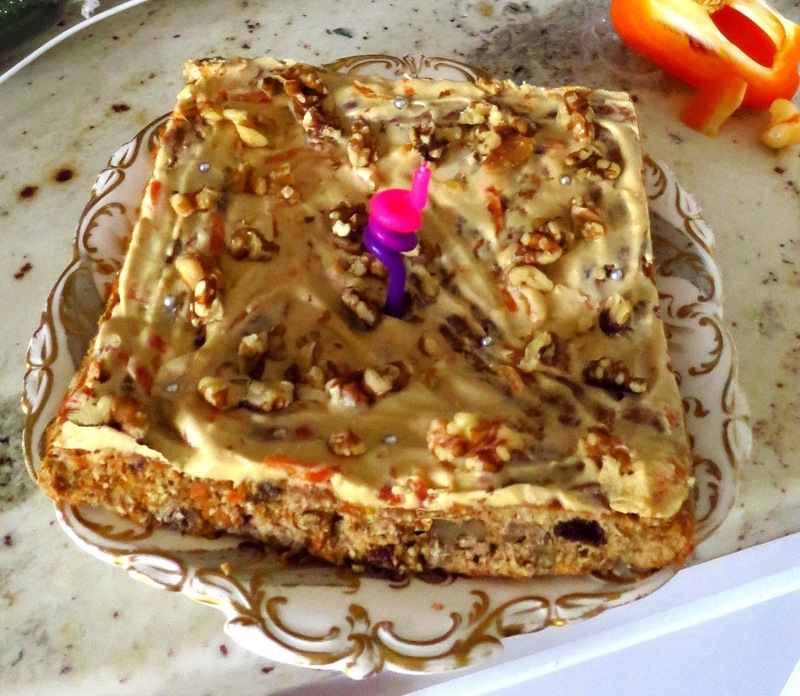 (I love carrot cake -- your recipe sounds a bit like mine!). I love learning a bit about your day, your week. Makes me smile! Thank you for sharing such a glorious day out. 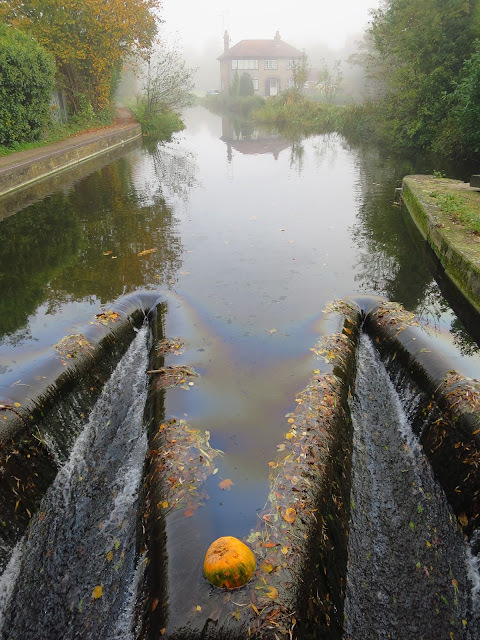 The photo of the pumpkin in the canal is particularly eloquent! Yes, the poor thing looked so forlorn. And even though the oil was a cause of some dismay to the local boat people, I think it did look so pretty! Your world is much prettier than mine! My only plans for the upcoming weekend is to buy more goods for Thanksgiving and maybe get hubs to help me sort a few cabinets. Your life seems more colorful than mine. Thank you for the condolences, I wrote about her in a reply to a comment above (sorry I'm being really slow to get around to answer comments, though I read em all immediately). Your life always seems so full of humour one of the joys of blogging to get an insight in to other peoples worlds. Autumn pics and cake in the same post - wonderful!! WOW! You have an eye for photography. Lots and lots of good stuff. Thanks for sharing. PS: Loved the cake. I felt sad for the pumpkin. oh my goodness, you DO manage to cram a lot of living into your life! 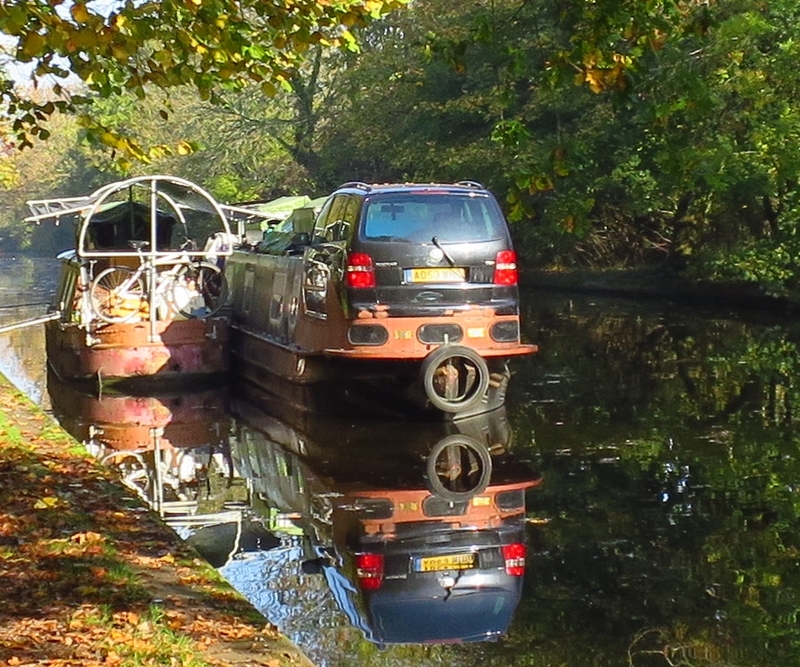 The automobile barge is peculiar, maybe that is where they keep their chickens? Wonderful adventure, wonderful photos! Sounds to me like taking a risk cycling in to London! You are brave! I think the car idea was something to do with the reverse gear??? I really couldn't quite figure out what the purpose of it was but you know I am not sure it actually needed a "purpose" sometimes things are just fun, and that's why I would like it. Plenty to absorb in your, as per usual, interesting and photo spectacular post. You have quite the busy lifestyle. I suddenly have this urge to go live on a canal barge. Okay, maybe not in the winter. You're life is so much more interesting than mine! I love how you're always going someplace new. That cake in the first picture looks really yummy! That car barge is interesting. Don't think I've ever seen anything quite like that before. I'm sorry for the loss of your friend. That's so sad! Not one to idle away the hours, are you! You sound very, very busy! I'm fascinated most by life on the canals, but I also loved seeing whatever else your lens saw on your biking tour. Sorry for your loss. Losing a friend is never easy. The carrot, orange and nut cake looks wonderful. So does the amazing golden birthday cake. The rope figurehead is most ingenious - from a distance, it must look like a real person. I love all the nature photos, especially the fantastic autumn colours. 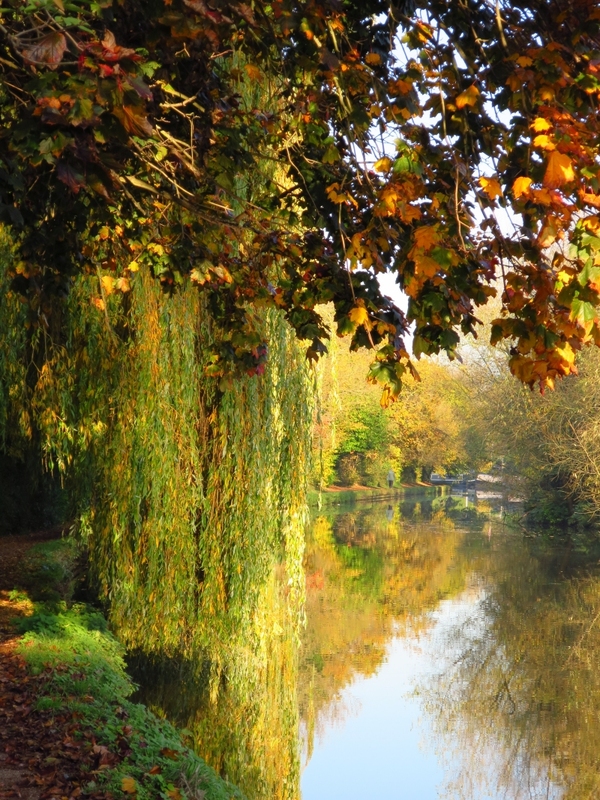 As a kid, me and my sister and parents used to walk along the canal quite a lot, usually taking a picnic lunch with us. 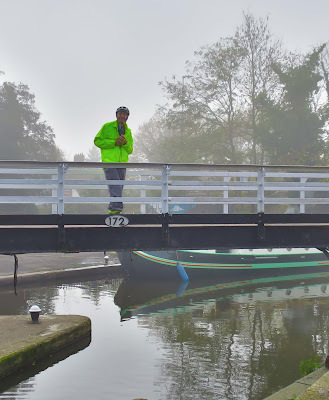 I loved this post, Jenny, especially (as you might guess) the part about your cycle ride along the canal and all the photos. What an amazing boat with the car built in! I'm so sorry you lost your friend. Your last photo is too beautiful for words. I adore cranes and this photo makes them look so magical. mesmerizing photos.... yummy cake.. really enjoyed ur post !! That transition from the 18th to the 19th century is really interesting - finding out more about it is definitely on my "to do" list. Thinking "off-the-cuff", it's interesting how music became more wild and licentious as society aspired to be less so. If I'm right, perhaps people look in music for what is denied them in life. Music, being word and image-less, is a tougher nut for the censorship to crack than art and literature. (I'm not just thinking of offical censorship but of the censorship of social consensus). I enjoyed all of your captures and the beautiful leaves. They are so special. I did not know you had such a talent to make cakes! The cake with lot's of nuts looks delicious and one candle on it is cute. Glad to know that you did not break the delicate web. Your week seems to have been so colorful and spicy in various respects, Jenny. I often wonder if there are any uneventful weeks to you. Your autumn scenes are fabulous. I especially like the fifth image from which I can’t decide which is better to travel by boat on the canal or to walk along the canal. I like best to cycle along the canal, I think, Yoko, although it is very peaceful and relaxing to travel by narrow boat. 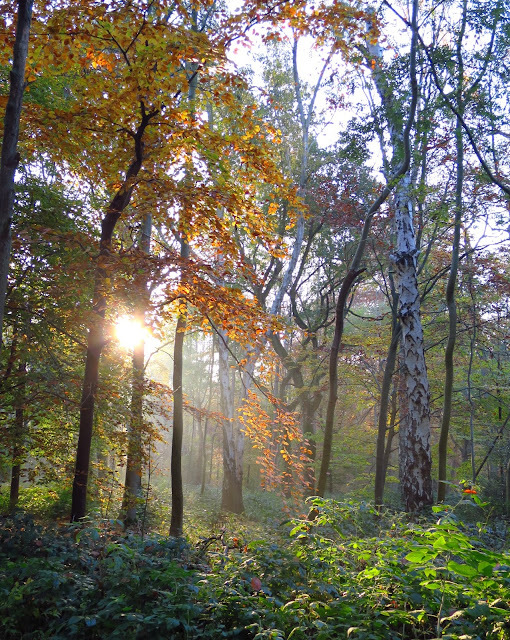 Lovely photographs, particularly the one of the woods. I always laugh about the blackberry saying, because the brambles are always later in Scotland than in England, so if we listened to that saying then we'd never pick any! I've always heard it as the devil spitting on them, rather than a witch. I'm glad to see a post about your daily life. Your bike ride photos are lovely, especially the mushroom the rosehips, and the two photos featuring weeping willows. (I love willows.) The cake you baked looks yummy, even if it is healthy! It was fun to read bit and pieces about your daily life and see the photo's you took as you made your rounds. 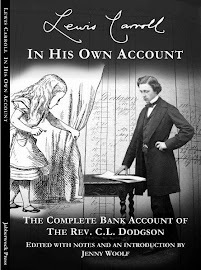 The book sounds interesting, will have to see it if is available here. Lovely Autumn pictures. I too made a birthday cake at Halloween - for my daughter- and it too had only one candle, for the same reasonas yours. Nice photos, specially of the autumn leaves. I certainly admire your energy - a photographic record of my typical day would look like a series of similar images of my desktop. But who knows when the next generation of smart phones comes out (let's call it 5G) they will have an app which will photograph what goes on in your kind. Now that is worth waiting for. I love the autumnal shots. It must have been a beautiful day at the locks. Really lovely scenery. I always love to watch photos and lifestyle of different countries. And this your bike jogging seems so wonderful. There were tons of neat photos here. I really enjoyed viewing them. 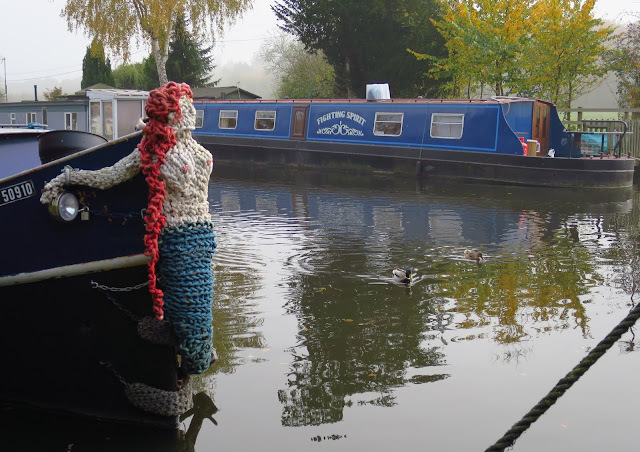 Loved the Mermaid on that one boat, the gorgeous fall colors, the spiderweb, the weird mannequins. - Also a request...I am following your blog as a Google follower but would love it if you would add the Follow By E-Mail feature to your blog. That way when you post new posts they come directly to my "in-box" and I can visit and comment faster. Love your photos of the canals in the mist, and of the canal boats. I've always thought it would be fun to travel slowly across the countryside in a canal boat. Thanks for your comment on my blog. A day out on the bikes, sounds wonderful, very wonderful pictures. What a thoroughly fabulous post Jenny! 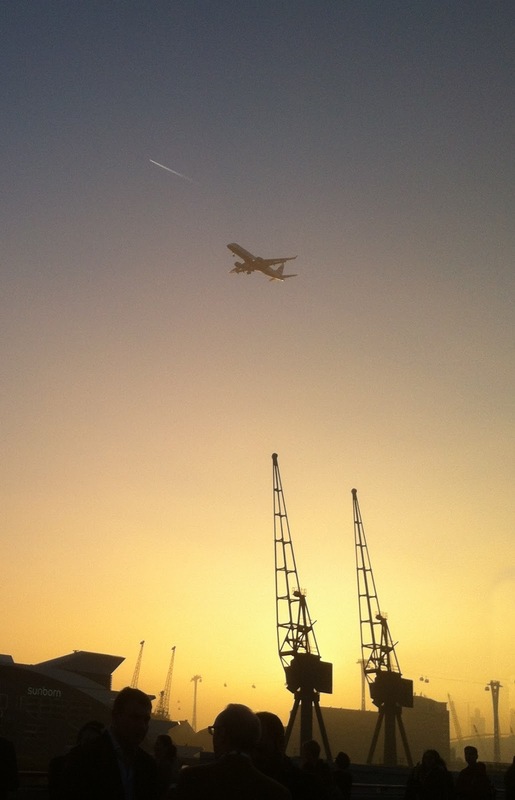 Your photos are wonderful and really evoke a sense of place that makes me want to visit the UK (actually, I ALWAYS want to visit the UK anyway!) Lovely to hear about all your nice outings and the berries you picked and cake and marmalade you made. Very sorry to hear about your friend - such a difficult time for you. I recently read a book called Harriette Wilson - the Greatest Courtesan of Her Age which was an eye-opening introduction to the latter part of the era you have been reading about. I imagine she may well rate a mention in the tome you are reading. Was very impressed to read that you ride a bike around London! Busy day, Jennifer! 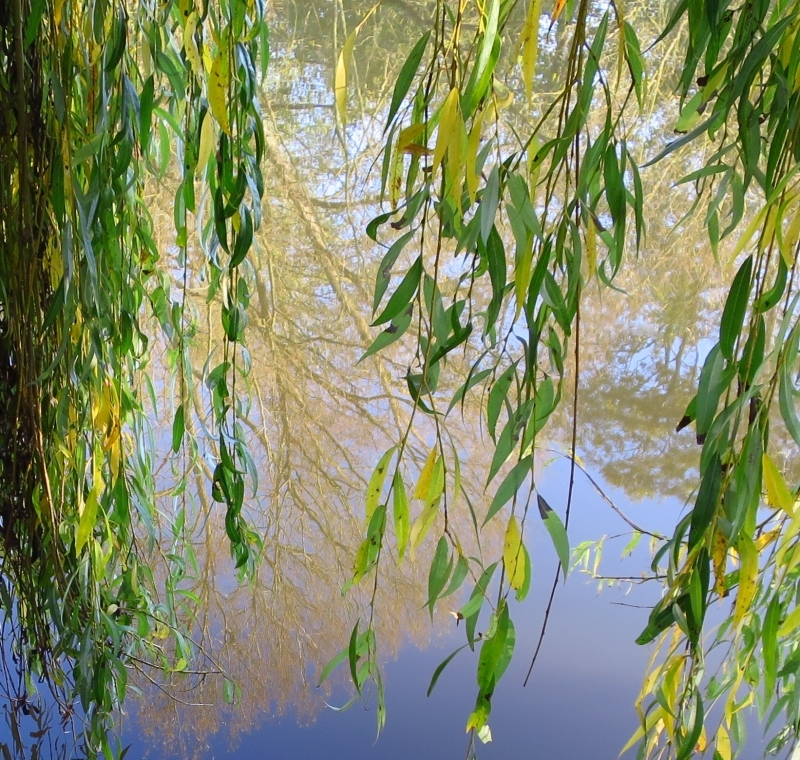 Love your 'Leaves and reflections' and Autumn day, wonderful photos. I liked this saying and am sure these berries were tasty in the end of October. Your post has so many beautiful photos – I would not know which one I like best. Often oil in body of water, like you show, comes from the oil spots on pavements from cars, and when it rains the oil ends up many places. I made a cake last night, chocolate and pears – my own recipe – and I did not like it! I need to bake cakes that have been tested. I also have never made orange marmalade - that I love on an English muffin. This year I made fig, strawberry, raspberry-ginger, spiced apricot and spiced blueberry jams. I made cranberry jam last year and it was tart and good too. Disorder in England in those days … from an article I read, the British were a lot wilder than the French at that time, even though Paris had the bad reputation. As a teenager I always liked to go to London for Christmas vacations because my friends there gave a lot more parties than my friends in Paris – I started going to London at 13 1/2 years old and went every Christmas until I was 20! Much more fun than in Paris, don’t you know. I even wrote a post on a London party on a post – see here http://avagabonde.blogspot.com/2011/12/recollection-new-year-party-to-remember.html . That is a lovely post! I would love to taste raspberry-ginger jam, I have never tried that. Is that your own idea too? I think often the things we make up are the best, but it can be useful to have a recipe as a basis. The 18th century British were notoriously wild, but I think that this was often interpreted as their being in pursuit of "freedom". However the French went further than this in their pursuit of freedom, so perhaps the truth was more that the English didn't manage to overthrow their rulers so the reaction against the wildness led to the Victorian era of repression and morality. You got some great autumnal shots. I love to cook but I'm not much of a baker. I did make a Guinness chocolate cake for my sons the other day, which they liked. 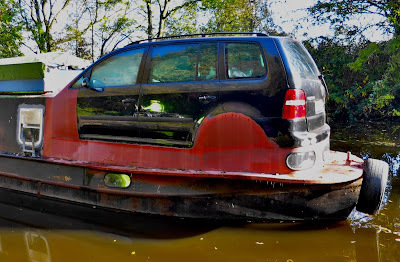 Just been scrolling through your recent posts and then I see a car on a canal boat! Certainly a first. Definitely sunsets are more interesting in the winter. Thanks for your visit and comments.